Dr Davison received his doctorate in naturopathic medicine in 1986 from the National College of Naturopathic Medicine and his post doctoral acupuncture degree from the Oregon College of Oriental Medicine and Beijing College of Traditional Chinese Medicine in 1987. Experience Regenerative Injection Techniques-Neural therapy, Prolotherapy, Myofascial Trigger Point Therapies-1995 to present. Regenerative Medicine Clinic, Prolotherapy and platelet rich plasma therapy for spine, and joint pain and emphasis in sports medicine and connective tissue regeneration. Haiku, Maui. 1998-present. Maui East West Clinic, Functional Medicine, Sports Medicine and Anti-Aging Clinic, Kahului, Hawaii –Director 1989-1998. Hawaii Society of Naturopathic Medicine, President 1998-1999. Tavarua Island surf resort, Fiji, On site physician caring for emergency medicine needs. One to two week periods from 2001 -2006. Dr. Davison is an active waterman and adventure travel enthusiast. He has written and lectured for the Wilderness Medical society and has been an on site doctor for surf resorts, and surf travel charter boats. He has taught both prolotherapy and prp therapy in Asia, North America and Hawaii. His passion is to help people recover from soft tissue injuries that impeded them from getting back to and surpassing their true potential. He believes that all of us can be active into our later years if we follow some of the regenerative methods found in both traditional medical systems, movement therapies and modern regenerative medical techniques. 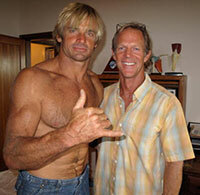 He has practiced at the Regenerative Medicine Center in Maui Hawaii for over 10 years and takes care of the many professional surfers, windsurfers, paddle boarders, and watermen/women who live and play there. He has been the first to offer platelet rich plasma and prolotherapy on Maui and is recognized as the expert in RIT therapies (regenerative injection techniques). The utilization of nutritional therapies and specific movement practices are prescribed to assist in the specific injection therapies. The Regenerative Medicine Center specializes in helping remove the obstacles preventing you from full recovery from pain and dysfunction that impedes your ability to play and return to your active lifestyle. We also pride ourselves in making the experience as minimally painful and least invasive as possible.